All the rumors in recent years about the Arizona Coyotes moving from their present location in Glendale turned out to be true. No, not movement to sites in North America, but directly across the Phoenix metro area. Designs were unveiled during a news conference Monday afternoon to partner with Arizona State University and construct a multi-use complex to include a state-of-the-art, NHL-ready arena east of the downtown area. Located on a 58-acre portion of the ASU campus in the east community of Tempe, plans call for the arena to house the Coyotes, a smaller arena seating about 4,000 and a hotel on site. That’s the initial blueprint, but Anthony LeBlanc, the Coyotes president, indicated these three buildings represent only the beginning of an ambitious mix-use tract. 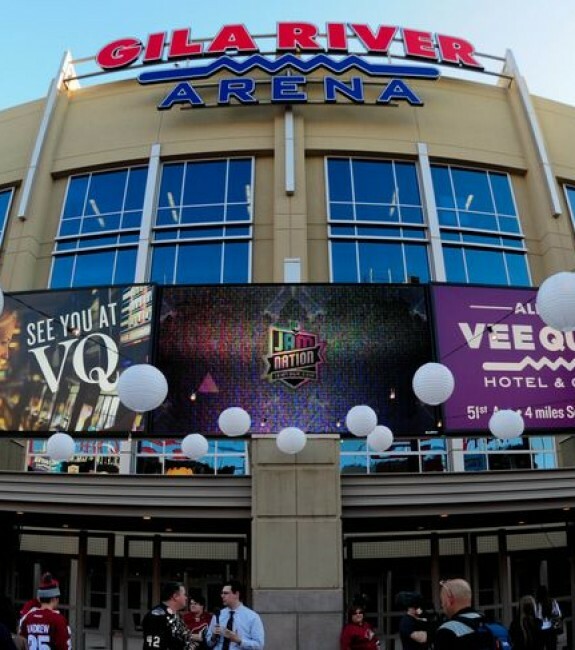 Moving to Tempe, site of the main Arizona State University campus, represents the culmination of a contentious relationship between the Coyotes and the city of Glendale, site of the Gila River Arena and the Coyotes’ home rink. In June, 2015, the city of Glendale voted to abrogate a 15-year agreement with the Coyotes, and force the team to seek another venue. The termination included a two-year lease, which enabled the Coyotes use Gila River Arena through this current season. 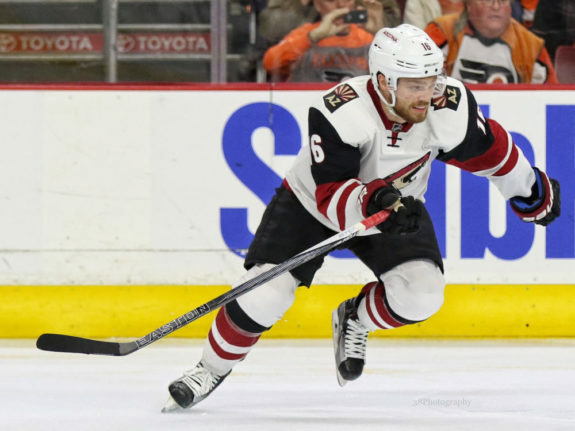 The termination also provided the Coyotes to use the facility on a short-term basis, which LeBlanc said the team would engage until the new arena is completed. With word the Coyotes are leaving Glendale, there is now no major tenet for the Gila River Arena. That puts Glendale taxpayers liable for $145 million in debt on the facility through 2033. In partnering with Arizona State, LeBlanc said land acquisition represented a significant portion of the ASU investment. Since ASU owns the land, the Coyotes plan to enter a long-term agreement, though LeBlanc did not reveal the length of a possible arrangement. At the same time, LeBlanc indicated the cost of the complex would run around $400 million. The Coyotes, he pointed out, will contribute half to the cost, and the other $200 million will come from taxes and other public revenues. At this point, the proposed arena has a seating capacity of 16,000 and that’s below the two most recent NHL arenas. Completed for the current season, Rogers Place in Edmonton has a capacity of 18,641 and the T-Mobile Arena, home for the new Las Vegas team, has a capability of 17,500 for hockey. Certain the 16,000 figure was flexible, LeBlanc indicated the Coyotes will work with the NHL to bring the new building up to league specifications. Current capacity of Gila River Arena is 17,125. In addition to the main arena, plans call for an additional facility to house Coyotes practices and community events. Noting that the Phoenix metro area now has “two additional sheets of ice,” LeBlanc said this facility will help grow and aid in the development youth hockey throughout the region. Hoping to receive municipal approval during the legislative session which commences in January, LeBlanc would like to put shovels in the ground by this coming summer. That would put completion of the arena in time to start the 2019-20 NHL season in Tempe. Negotiations to partner with Arizona State University commenced two years. That’s when the Coyotes had that final, falling out with the city of Glendale, and the ASU Sun Devils joined Division I for hockey. Over the past two years, ASU played several games in Gila River Arena, and LeBlanc said a strong relationship developed and now endures.